Listen to the instructor while you view the powerpoint slides. Just like attending the lecture in person but you can review at your leisure anything that you missed the first time around. All courses provide 12 months of access from date of purchase. These online self learning modules are presented by Vergie Hughes RN, MS, IBCLC, FILCA, an International Board Certified Lactation Consultant (IBCLC) with over 25 years of clinical and teaching experience. They provide the basics of lactation management for those with little previous experience or training as a breastfeeding counselor. "A wealth of information..." "...concise and well written"
"The Alternative Feeding Methods chapter covers a topic that is often hard to find..."
Reviews the 4 most common positions for breast-feeding, correct latch-on and the importance of timing of feedings. 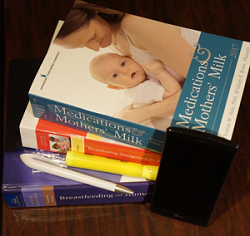 Covers all the information you need to get mothers off to a good start in breastfeeding. Describes common breastfeeding problems, their causes, and suggested remedies. Discusses the various types of breast pumps available and the advantages and disadvantages of each. Also describes hand expression. Freezing, thawing, and storage of breastmilk are included. Guidance for those instructing mothers of premature infants how to establish a milk supply, determine readiness for breastfeeding, transition the baby to the breast and prepare for home care. Alternatives when babies temporarily cannot breastfeed. Includes determining when extra feedings are needed, cup and spoon feeding, finger feeding, and complementary feeding at the breast. We also offer bundles of courses from 15 to 20 credits. Check out our enriched 90 hour course and 45 hour bundles, get all of your required hours in one place! More than 20 practicing professionals were carefully selected to teach in their area of expertise. We have trained successful students for over 20 years! Easy to use online courses offer you the convenience of studying at home on your schedule using any type of device, day or night. Our courses save you money! No airfare, hotel expenses, lost wages or time away from your family. The Lactation Consultant Training Program is comprehensive and designed to cover all aspects of the IBLCE Exam Blueprint. You are truly prepared to sit for the IBLCE exam. *This link goes to the official webpage but has a certificate error. It is safe to view.